Three solid days of live performance and music discovery await us at the venerable Newport Folk Festival. The high-quality lineup — in the most beautiful setting — is what sets Newport apart on the ever-growing festival landscape. This year, the announced artists were great even before they added the big headliner names (Ryan Adams, Jack White, Norah Jones and Jeff Tweedy) — imagine, Conor Oberst, Dawes, Jenny Lewis and Jimmy Cliff all playing in the same weekend! Amazing, and we can expect collaborations for sure. Making it all even more special, Newport will honor the mighty Mavis Staples for her 75th birthday to close out the festival on Sunday evening, and I bet Norah Jones and Jeff Tweedy (and who knows who else) will be joining in that celebration. No one will be leaving Newport early. Friday: Phox - A new band from Wisconsin fronted by a completely engaging lead singer, and Lake Street Dive - FUV faves who are capturing more fans with each appearance. Saturday: Check out Willie Watson for straight up, old-fashioned country sounds and J Roddy and the Business for some driving "classic" rock; welcome Shakey Graves, a one-man band from Austin, where you've got to be really good to stand out; Lucius - New York's own highly entertaining and accomplished band bringing their harmonies to the harbor skies; and Benjamin Booker - a punky young guy from New Orleans, another place it can't be easy to make a name for yourself. Sunday: Catch the unforgettable voice of Hozier - a poetic, powerful new artist from Ireland; and give a listen to Hurray for the Riff Raff's quirky folky sounds. Live Broadcast: Ryan Adams, Friday at 6pm on 90.7FM or online. 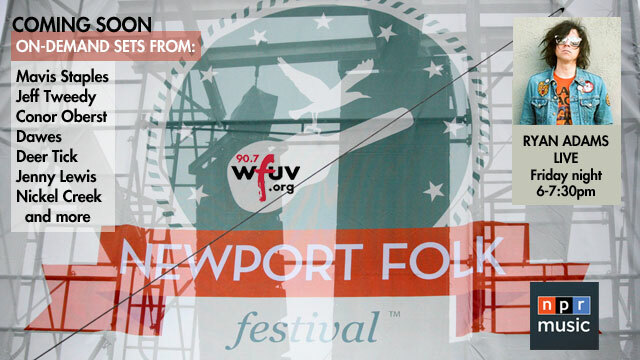 Then all weekend long, FUV will be at Newport's main Fort Stage, posting performances in the FUV Vault. Headed to Newport? Stop by the FUV tent by the Fort Stage and say hi, and remember to add #SummerofFUV to any pics you post. Here is the full festival schedule to start mapping out your musical itinerary. Funding for WFUV's ongoing coverage of live concerts and festivals comes from The Agnes Varis Trust, supporting affordable access to the arts, education and healthcare.